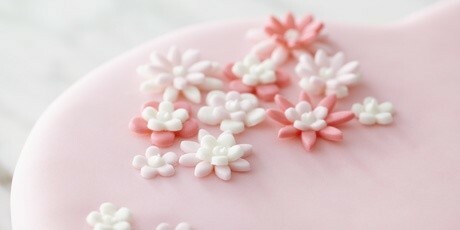 In episode Pound cake of TV show Bake with Anna Olson prepares Anna Olson recipe for Fondant Flowers. Fondant Flowers - Divide the fondant into four equal pieces. Set one piece aside, wrapped in plastic to prevent drying out, for white flowers. Tint the other three pieces different shades of pink, using a toothpick to add paste colour a little at a time and kneading in. Wrap each piece in plastic and set aside until ready to roll. Roll the first piece of fondant on a very clean work surface, to about 1/8-inch thick, using icing sugar to roll to prevent sticking. With different size flower cutters, cut out flowers and place on a parchment lined baking tray. Continue with the other three pieces giving you an array of different sizes and flower shape cutouts. Royal Icing - For the royal icing, beat the meringue powder, icing sugar and warm water with an electric mixer until smooth and structured (you can always adjust the consistency by adding more icing sugar to thicken or water to loosen). Spoon the icing in a piping bag fitted with a small plain tip. 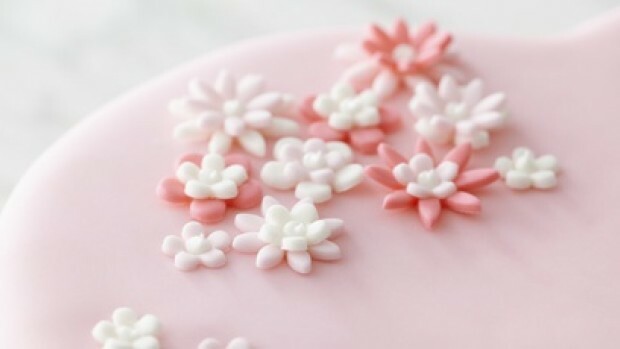 When you are ready to adhere the flowers to your cake, use the royal icing as “glue” and place a small dot of icing on the back of the flower. Using a small dowel (usually supplied with the fondant cutters) or a bamboo skewer to press the flower on the cake, pulling the pedals up slightly to form the shape of the flower. Continue with the rest of the flowers in whatever pattern you would like. You can add texture and dimension to the flowers by placing smaller flower cut outs in different shades on top of the base flower. With the icing, pipe a small dot in the centre of each flower. Allow at least 2 hours for the icing to set and store the cake following recipe instructions.